1 Rhetorical question meaning "Those places where my homeland lies." 2 Also .eu, shared with other European Union member states. 3 Shared code 42 with Slovakia until 1997. The Czech Republic is a landlocked country in Central Europe and a member state of the European Union. Though one of the youngest nations, its history goes back over a thousand years. Today the country has borders with Poland to the north, Germany to the northwest and west, Austria to the south, and Slovakia to the east. The capital and largest city is historic Prague, a major tourist attraction. The country is composed of two entire historic regions, Bohemia and Moravia, and parts of Silesia. As Czechoslovakia, independence was gained after World War I, but the country came under communist leadership for more than 40 years, until the breakup of the Soviet empire in 1989. The new country was divided into the Czech Republic and Slovakia on January 1, 1993, in a peaceful split known as the 'Velvet Divorce'. The Czech landscape is quite varied; Bohemia to the west consists of a basin, drained by the Labe and Vltava rivers, surrounded by mostly low mountains such as the Sudetes, where one finds the highest point in the country, the Sněžka, at 5,256 feet (1,602 m). Moravia, the eastern part, is also quite hilly and is drained predominantly by the Morava River, but it contains the source of the Odra River. Water from the landlocked Czech Republic flows to three different seas: the North Sea, Baltic Sea, and Black Sea. The Czech Republic also possesses a 30,000-square-meter exclave in the middle of the Hamburg docks that was awarded to Czechoslovakia by the Treaty of Versailles to allow the landlocked country a place where goods transported downriver could be transferred to seagoing ships; this territory reverts to Germany in 2018. Natural resources include coal, lead, zinc, iron ore, and uranium ore. The Czech Republic has a temperate, continental climate with relatively hot summers and cold, cloudy winters, usually with snow. Most rain is during the summer. The temperature difference between summers and winters is relatively high due to the geographical position - no access to the sea. Even within the Czech Republic, temperatures vary a lot depending on the altitude. In general, at higher altitudes the temperatures decrease and precipitation increases. Another important factor is the distribution of the mountains. At the highest peak (Snezka - 1602 m) the average temperature is only -0.4°C, whereas in the lowlands of South Moravia, the average temperature is as high as 10°C and this also applies for Prague, the capital, but this is due to urban factors. From December to January, there is usually snow in the mountains and sometimes also in the major cities and lowlands, but it tends to melt quickly. During March, April and May, the temperatures usually increase rapidly, and especially during April the temperatures and weather tend to vary a lot during the day. Spring is also characterized by high water levels in the rivers due to the snow melting and there are often floods. Severe flooding caused widespread damage in 2002. The warmest months of the year are June to August. On average, the summer temperatures are about 20°C higher than during winter. Especially in the last decade, temperatures above 30°C are not unusual. Summer is also characterized by rains and storms. Autumn usually begins in September, which is still relatively warm, but much drier. During October, temperatures usually fall back under 15 or 10°C and deciduous trees begin to drop their leaves. By the end of November, temperatures usually range around the freezing point. Archaeologists have found evidence of prehistoric human settlement in the area dating back to the Neolithic era. From the third century B.C.E. a Celtic people from northern and eastern Europe known as the Boii settled in the area and gave the region of Bohemia its name. Later, in the first century C.E., Germanic tribes of Marcomanni and Quadi settled there. Around the fifth century, many Germanic tribes moved westward and southward out of Central Europe, toppling the Roman Empire. In an equally significant migration, Slavic people from the Black Sea and Carpathian regions settled in the area (a movement that was also stimulated by the onslaught of peoples from Siberia and Eastern Europe: Huns, Avars, Bulgars, and Magyars). Following in the Germans' wake, they moved southward into Bohemia, Moravia, and some of present-day Austria. The largest group of Slavs that settled in Bohemia were the Cechove, today known as Czechs. During the seventh century the Frankish merchant Samo, supporting the Slavs fighting their Avar rulers, became the ruler of the first known Slav state in Central Europe. After his death in 658, the region was dominated by the Franks, who brought it under the rule of Charlemagne. The Moravian principality arose in the eighth century under the leadership of the Slavic chief Mojmir. The Moravian empire included parts of Bohemia, Moravia, Poland, and Slovakia, until it was overthrown by the Magyars. The Bohemian or Czech state emerged in the late ninth century when it was unified by the Přemyslids, a group of Czech princes. The kingdom of Bohemia was a significant local power during the Middle Ages. It was incorporated into the Holy Roman Empire in 950. The Přemyslid dynasty lasted into the fourteenth century. Under the leadership of Charles IV, Bohemia became a powerful state. He built the city of Prague into an imperial capital and founded the University of Prague in 1348. In 1355 he became Holy Roman Emperor. Religious conflicts such as the fifteenth-century Hussite Wars between reformers and the pope's forces and the seventeenth-century Thirty Years' War between Catholics and Protestants had a devastating effect on the local population. From the sixteenth century, Bohemia came increasingly under Habsburg control. After the fall of the Holy Roman Empire in the wake of Napoleon's 1805 victory at the Battle of Austerlitz, Bohemia became part of the Austrian Empire and later of Austria-Hungary. Following the collapse of the Austro-Hungarian empire after World War I, the independent republic of Czechoslovakia was created in 1918. This new country incorporated regions with majority German-, Hungarian-, Polish-, and Ruthenian-speaking populations. Although Czechoslovakia provided what was at the time rather extensive rights to its minorities, it did not grant them territorial or political autonomy, which resulted in discontent and strong support among some of the minorities to break away from Czechoslovakia. Adolf Hitler used the opportunity and, supported by Konrad Henlein's Sudeten German Party, gained the almost wholly German-speaking Sudetenland through the Munich Agreement. Poland occupied areas with a Polish minority around Český Těšín, while Slovakia gained greater autonomy, with the state renamed "Czecho-Slovakia." Eventually Slovakia broke away further in March 1939, allied to Hitler´s coalition. The remaining Czech territory was occupied by Hitler, who installed the so-called Protectorate of Bohemia and Moravia, which was proclaimed part of the Reich; the Protectorate's president and prime minister were subordinate to the Nazi Reichsprotektor ('imperial protector'). Approximately 390,000 citizens, including 83,000 Jews, were killed or executed, and hundreds of thousands of others were sent to prisons and concentration camps or forced labor. The Czechoslovak government-in-exile and its army fighting against the Germans were acknowledged by the Allies (Czech troops fought in Great Britain, North Africa, the Middle East, and the Soviet Union). The Prague uprising ended the war. In 1945-1946 almost the entire German minority of Czechoslovakia, about 2.7 million people, were expelled to Germany and Austria. During this time, thousands of Germans were held in prisons, detention camps, and used in forced labor. In the summer of 1945, there were several massacres. Only 250,000 Germans who had been active in the resistance against the Nazis or were necessary for the economy were allowed to stay, though many of them emigrated later. Czechoslovakia uneasily tried to play the role of a "bridge" between the West and East. However, the Communist Party of Czechoslovakia rapidly increased in popularity, particularly because of a general disappointment with the West (due to the prewar Munich Agreement) and a favorable popular attitude toward the Soviet Union (due to the Soviets' role in liberating Czechoslovakia from German rule). In the 1946 elections, the Communists received a plurality of the vote (38 percent) and became the largest party in the Czechoslovak parliament. They formed a coalition government with other parties of the National Front and moved quickly to consolidate power. The decisive step took place in February 1948. During a series of events characterized by communists as a "revolution" and by anti-communists as a "takeover," the communist People's Militias secured control of key locations in Prague, and a new, all-communist government was formed. For the next 41 years, Czechoslovakia was a Communist state within the eastern bloc. This period was marked by a variety of social developments. The Communist government nationalized the means of production and established a command economy. The economy grew rapidly during the 1950s and 1960s but slowed down in the 1970s and stagnated during the 1980s. Meanwhile, the political climate was highly repressive during the 1950s (including numerous show trials), but became more open and tolerant in the 1960s, culminating in the Prague Spring. This was forcibly ended on August 21, 1968, when an invasion by Warsaw Pact troops ended the efforts of the country's leaders to introduce political pluralism and create "socialism with a human face." From then until 1989, the political establishment returned to censorship of opposition, but without the highly repressive measures of the 1950s. In November 1989, Czechoslovakia returned to a multi-party political system through a bloodless "Velvet Revolution." However, Slovak national aspirations strengthened until, on January 1, 1993, the country peacefully split into the independent Czech and Slovak republics. Both countries went through economic reforms and privatizations, with the intention of creating a market economy. From 1991 the Czech Republic, then Czechoslovakia, has been a member of the Visegrad Group and from 1995 of the Organization for Economic Cooperation and Development (OECD). Ceremonial guards outside Prague Castle. Czech Republic is a pluriform multi-party parliamentary representative democratic republic, where the prime minister is the head of government. The Parliament is bicameral, with a Chamber of Deputies and a Senate. The Czech Republic became a member of the North Atlantic Treaty Organization, along with Poland and Hungary, on March 12, 1999. 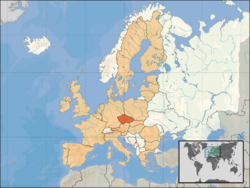 The Czech Republic became a full member of the European Union on May 1, 2004. Both events are milestones in the country's foreign policy and security orientation. The Czech Republic is scheduled to host the rotating EU presidency during the first half of 2009. The country was scheduled to fully implement the Schengen Agreement and therefore abolish the border controls with all its neighbors (Germany, Austria, Poland, Slovakia) as of December 31, 2007. The Czech armed forces consists of land and air forces and specialized support units. 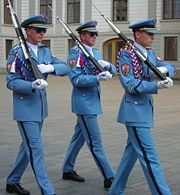 In 2004 the Czech military completely phased out conscription and transformed into a fully professional military force. Military spending is around 1.8 percent of GDP (2006). 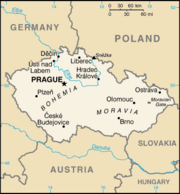 The Czech Republic is divided into thirteen regions with their own assemblies and the capital city Prague. The older 73 districts; three statutory cities with the status of districts (Brno, Ostrava, and Plzeň); and the city-district-region of Prague were disbanded in an ill-executed administrative reform; they are still traditionally recognized, however, and remain the seats of various branches of state administration. Of the former communist countries in central and eastern Europe, the Czech Republic has one of the most developed and industrialized economies. Its strong industrial tradition dates to the nineteenth century, when Bohemia and Moravia were the industrial heartland of the Austro-Hungarian Empire. The Czech Republic has a well-educated population and a well-developed infrastructure. The country's strategic location in Europe, low-cost structure, and skilled work force have attracted strong inflows of foreign direct investment. This investment is rapidly modernizing its industrial base and increasing productivity. At the time of the 1948 communist takeover, Czechoslovakia had a balanced economy and one of the higher levels of industrialization on the continent. In 1948, however, the government began to stress heavy industry over agricultural and consumer goods and services. Many basic industries and foreign trade, as well as domestic wholesale trade, had been nationalized before the communists took power. Nationalization of most of the retail trade was completed in 1950-1951. The economy saw growth during the 1970s but then stagnated between 1978 and 1982. Attempts at revitalizing it in the 1980s with management and worker incentive programs were largely unsuccessful. The economy grew after 1982, achieving an annual average output growth of more than 3 percent between 1983 and 1985. Imports from the West were curtailed, exports boosted, and hard currency debt reduced substantially. New investment was made in the electronic, chemical, and pharmaceutical sectors, which were industry leaders in eastern Europe in the mid-1980s. The "Velvet Revolution" in 1989 offered a chance for profound and sustained economic reform. Signs of economic resurgence began to appear in the wake of the shock therapy that the International Monetary Fund (IMF) labeled the "big bang" of January 1991. Since then, astute economic management has led to the elimination of 95 percent of all price controls, large inflows of foreign investment, increasing domestic consumption and industrial production, and a stable exchange rate. Exports to former communist economic bloc markets have shifted to western Europe. Thanks to foreign investment, the country enjoys a positive balance-of-payments position. Despite a general trend over the last ten years toward rising budget deficits, the Czech government's domestic and foreign indebtedness remains relatively low. The Czech koruna (crown) became fully convertible for most business purposes in late 1995. Following a currency crisis and recession in 1998-99, the crown exchange rate was allowed to float. Recently, strong capital inflows have resulted in a steady increase in the value of the crown against the euro and the dollar. The strong crown helped to keep inflation low. In 2004, inflation was about 2.8 percent, mainly due to increases in value added tax rates and higher fuel costs, and dropped to 1.9 percent in 2005. It hovered around 2.5 percent in 2006. The Ministry of Finance forecasts a rate of 2.4 percent for 2007. The Czech Republic will not adopt the euro earlier than 2012. The Czech Republic is gradually reducing its dependence on highly polluting low-grade brown coal as a source of energy, in part because of EU environmental requirements. In 2005, according to the Czech Statistical Office, 65.4 percent of electricity was produced in steam, combined, and combustion power plants; 30 percent in nuclear plants; and 4.6 percent from renewable sources, including hydroelectric power. Russia (via pipelines through Ukraine) and, to a lesser extent, Norway (via pipelines through Germany) supply the Czech Republic with liquid and natural gas. The government has offered investment incentives in order to enhance the Czech Republic's natural advantages, thereby attracting foreign partners and stimulating the economy. Shifting emphasis from the East to the West has necessitated adjustment of commercial laws and accounting practices to fit Western standards. Formerly state-owned banks have all been privatized into the hands of west European banks, and oversight by the central bank has improved. The telecommunications infrastructure has been upgraded and the sector is privatized. The Czech Republic has made significant progress toward creating a stable and attractive climate for investment, although continuing reports of corruption are troubling to investors. Its success allowed the Czech Republic to become the first post-communist country to receive an investment-grade credit rating by international credit institutions. Successive Czech governments have welcomed U.S. investment in addition to the strong economic influence of Western Europe and increasing investment from Asian auto manufacturers. Inflows of foreign direct investment in 2005 were $11.7 billion, more than double the previous year. In 2006, FDI dropped back to previous levels at roughly $6 billion. The Czech Republic boasts a flourishing consumer production sector. In the early 1990s most state-owned industries were privatized through a voucher privatization system. Every citizen was given the opportunity to buy, for a moderate price, a book of vouchers that he or she could exchange for shares in state-owned companies. State ownership of businesses was estimated to be about 97 percent under communism. The non-private sector is less than 20 percent today. Unemployment declined to 7.7 percent in 2006. Rates of unemployment are higher in the coal and steel producing regions of Northern Moravia and Northern Bohemia, and among less-skilled and older workers. The economy grew 6.1 percent in 2005 and experienced similar growth in 2006. The current right-of-center coalition government has committed itself to reducing the deficit to 3 percent of GDP by 2008, from 4.7 percent in 2006. Planned reforms involving reduction of currently mandatory expenditures to meet Maastricht criteria for adoption of the euro will prepare the Czech Republic for accession to the euro zone in 2012 at the earliest. The Czech economy gets substantial income from tourism: in 2001, the total earnings from tourism made up 5.5 percent of GNP and 9.3 percent of overall export earnings. The industry employs more than 110,000 people - over 1 percent of the population. The centers of tourist activity include the historic city of Prague, the most common point of entry for tourists visiting other parts of the country. Spa towns such as Karlovy Vary and Mariánské Lázně are particularly popular holiday destinations. Other popular tourist sites are the many castles and chateaux, such as those at Karlštejn, Konopiště, and Český Krumlov. Away from the towns, areas as Český Ráj, Šumava, and the Krkonoše mountains attract visitors seeking outdoor pursuits. The majority of the inhabitants of the Czech Republic are Czechs. The largest minorities are Moravians, Slovaks, Poles, and Roma people. The Czech Republic, along with Estonia, has one of the least religious populations in the EU. According to the 2001 census, 59 percent of the country is agnostic, atheist, non-believer or no-organized believer, 26.8 percent Roman Catholic, and 2.5 percent Protestant. According to a 2005 poll, 30 percent of Czech respondents do not believe in a god, spirit, or life forces, although 50 percent believe in some sort of spirit or life force and 19 percent believe in a god. The country is famous for its love of puppetry and marionettes. Under the communist regime, prominent writers, painters, and sculptors as well as museums, theaters, art galleries, and major orchestras were supported by the state. This generous support of theaters and orchestras meant that tickets to artistic events, from play readings to costly productions such as operas in Prague's National Theater, were affordable by all. Those in the arts who received state money had to conform to political and ideological dictates, or at least make certain that they did not offend the Soviet Union, those in power in their own country, and the Communist Party. Working under such strictures became unbearable for some of the most creative writers, such as Josef Škvorecký (1924–) and Milan Kundera (1929–), both of whom left the country to write and publish abroad. Jiří Trnka was a successful puppet maker, illustrator, motion-picture animator and film director, renowned for his puppet animations, who managed to work within the confines of the era. Dubbed "the Walt Disney of the East," his works carried subtle story lines expressing the struggles of life under a communist regime, bringing a voice and method of release to his fellows. Much of this subtility passed by the oppressors but was warmly embraced by the common man, who felt they had a voice in Trnka. Since 1945, the Karlovy Vary International Film Festival has drawn attention to the cinema production in Czech Republic. With airing of new films, competitions and awards, it has grown in importance, attracting thousands of young people, and for its fortieth anniversary jubilee, such notables as Madeleine Albright, Alan Alda, Lauren Bacall and Robert Redford. Since the velvet revolution of 1989, artists have enjoyed freedom of expression and most support themselves. However, prestigious artistic institutions and ensembles such as the National Theater, the National Gallery, and the Czech Philharmonic continue to receive state support. A world-famous fictional character is the "Good Soldier Šchweik" in the novel of that name by Jaroslav Hašek (1883–1923) published in 1923. The Good Soldier Šchweik portrays a complex character who, although discharged from military service for idiocy, is resourceful, expresses great compassion, and never stops making fun of the bureaucracy of the Austro-Hungarian Empire. Garrulous and ready to follow orders to the letter, Šchweik is the epitome of someone whose obtuseness helps him survive. The novel has been translated into many languages, filmed several times, adapted for theatrical presentations, and made into an opera. Among Czech composers, four are heard in the concert halls and opera houses around the world. Bedřich Smetana (1824–1884) composed the six symphonic poems My Country and the folk opera The Bartered Bride. Antonín Dvořák (1841–1904), who composed works in many genres, is known especially for his sixteen Slavonic Dances and Symphony No. 9, From the New World; he was also the founder and the director for three years of the National Conservatory of Music in New York (1892–1895). Leoš Janáček (1854–1928) was a Moravian composer known for strongly rhythmic and dramatic operas, such as Jenufa, and Bohuslav Martinů (1890–1959) composed operas, symphonies, and chamber music. ↑ Czech language Ministry of Foreign Affairs of the Czech Republic. Retrieved October 30, 2017. ↑ Slovak language may be considered an official language in the Czech Republic under certain circumstances. ↑ Citizens belonging to minorities, which traditionally and on long-term basis live within the territory of the Czech Republic, enjoy the right to use their language in communication with authorities and in front of the courts of law (for the list of recognized minorities see National Minorities Policy of the Government of the Czech Republic Retrieved October 30, 2017.). The article 25 of the Czech Charter of Fundamental Rights and Basic Freedoms ensures right of the national and ethnic minorities for education and communication with authorities in their own language. Act No. 500/2004 Coll. (The Administrative Rule) in its paragraph 16 (4) (Procedural Language) ensures, that a citizen of the Czech Republic, who belongs to a national or an ethnic minority, which traditionally and on long-term basis lives within the territory of the Czech Republic, have right to address an administrative agency and proceed before it in the language of the minority. In case that the administrative agency doesn't have an employee with knowledge of the language, the agency is bound to obtain a translator at the agency's own expense. According to Act No. 273/2001 (About The Rights of Members of Minorities) paragraph 9 (The right to use language of a national minority in dealing with authorities and in front of the courts of law) the same applies for the members of national minorities also in front of the courts of law. ↑ Czech Republic Population World Population Review. Retrieved October 30, 2017. ↑ 5.0 5.1 5.2 5.3 Czech Republic International Monetary Fund. Retrieved October 30, 2017. Countries and their Cultures. Czech Republic Retrieved October 30, 2017. U.S. State Department. Background Notes: Czech Republic Retrieved October 30, 2017. CIA World Factbook. Czech Republic October 30, 2017. This page was last modified on 20 November 2017, at 22:31.